The benefits of becoming a Certified Nursing Assistant (CNA) in Rhode Island are numerous and substantial. This certification leads to a rewarding career and provides opportunities in terms of employment and salary that are attractive in Rhode Island. In fact, hourly and salary wage rates for CNAs in Rhode Island are higher than the national average, which makes this an attractive state to choose for certification. In 2017, the requirements for certification as a Certified Nursing Assistant in Rhode Island are straightforward and achievable. Just as importantly, after CNA certification, Rhode Island is a fantastic place to build your nursing career. The certification requirements for a CNA in Rhode Island include the completion of an accredited and approved training program and passage of the state’s examinations. However, Rhode Island is among certain states that require CNAs to get licenses. Therefore, after the training and examination prerequisites are completed, an individual may apply through the Rhode Island Department of Health for licensing. These broad requirements can be broken down into the following steps. In order to ensure healthcare in Rhode Island is provided by knowledgeable, prepared individuals, the Department of Health in Rhode Island requires Certified Nursing Assistants in the state complete specific educational requirements prior to taking any examinations or obtaining a certification. For most individuals interested in this career, that means completing a training program approved by the Department of Health. The Department of Health prohibits any individual from qualifying for the state licensing examination who does not attend an accredited program. The exception, of course, is CNAs already certified in another state. There are several prerequisites to enroll in a CNA training program. 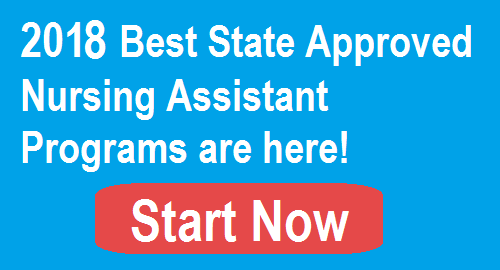 All applicants to the state-approved training programs in Rhode Island must have a high school diploma or pass an entrance examination and be at least 18 years of age. These requirements are handled as part of the application process to a specific program. The costs associated with nursing assistant training programs will vary by location and program. The less expensive programs in Rhode Island are offered by specialized medical education schools, compared to those administered by community colleges. However, the opportunity for financial aid is greater at the community college programs. As well, a significant number of current and former military members have an interest in health care, financial aid and other assistance is available for these individuals in Rhode Island. Rhode Island offers the unique opportunity to attend a CNA training program for free. According to the Department of Health, individuals who obtain employment within 12 months of graduation from an approved program can apply for reimbursement of their fees. According to the Department of Health, there are 49 CNA programs in Rhode Island that are approved by the state. These programs are located in cities across the state, with several in Cranston, Providence, and Woonsocket. A Certified Nursing Assistant career in Rhode Island starts with finding the CNA program that fits you best. The following table lists 49 state-approved CNA training programs in the State. The data is updated in November 2017. Cranston A Caring Experience Nursing Services, Inc.
Cranston Phenix Home Care, Inc.
East Providence Access Healthcare, Inc.
Riverside Health Care Connections Nursing Services, Inc.
Every accredited CNA training program must follow the Depart of Health’s approved curriculum in their CNA classes in Rhode Island. This includes a minimum 100 hours of combined training in class, laboratories, and clinical settings. Certain training programs in Rhode Island offer more extensive training that might include a total 124 total hours or more. Of the minimum 100 hours, at least 20 must be dedicated to practical training in the clinical setting. In certain programs, a greater number of practical hours are required before a candidate can graduate from the CNA training program. Typically, a training program takes three to four weeks on a full-time basis or an average five week, when completed at a part-time program. Like other states, Rhode Island relies on a national examination agency to certify CNAs in the state. Passage of these examinations is mandatory before anyone can work as a nursing assistant or other medication aide in the state. In Rhode Island, the National Nurse Aide Assessment Program (NNAAP) issues the requisite CNA exam. The Rhode Island Department of Health requires all Certified Nurse Aides to pass both the knowledge and skills evaluations provided by the NNAAP. The knowledge portion is multiple-choice and offered as a written examination or as an oral test, for individuals who require such accommodation. The skills portion of the examination is conducted through simulation. The skills test requires an examinee to demonstrate five total skills, one of which will be hygiene and the other four randomly selected on the day of testing. It is possible for a candidate to take both examinations on a single day and all candidates for licensure must pass the NNAAP examinations within twelve months of completing an accredited program in Rhode Island. The final step towards a CNA certification in Rhode Island is the application for licensure to the State Department of Health. A candidate for licensing must show documentation of completion of a certified program, including signature of the training coordinator and a passing score on both sections of the NNAAP exam. In addition, the Department of Health requires certain prerequisites, including that the applicant pass a physical examination, undergo a criminal background check, pass both a TB test and controlled substance test, and have updated records on immunization. There is a $35 application fee and the applicant must provide a passport-sized photo with all documentation. Each of these application requirement and other information can be easily found at the Department of Health’s website. Rhode Island has specific requirements for all CNAs to maintain their CNA license through the Department of Health. Anyone who wants to work as a CNA must be certain these renewal or reinstatement requirements are met. These processes are generally straightforward, but an individual who fails to maintain his or her license could face significant consequences, including indefinite loss of licensing. A CNA license in Rhode Island is valid for 24 months at a time. However, Certified Nursing Assistants do not need to retake examinations or undergo the application process again, provided their license is renewed on a timely basis. As well, anyone seeking to renew a license must provide evidence of at least 8 hours of employment as a CNA in the 24 months prior to renewal. The process for renewal of a CNA certification is handled through the Department of Health. There are options to available right on the Department of Health website, and only takes a matter of minutes renew CNA certification to complete. Alternatively, CNAs in the state can mail their renewal. There is a $40 fee payable to the Rhode Island Department of Health. If a Certified Nursing Assistant in Rhode Island lets his or her licensure lapse or does not work as a CNA for over 24 months, the individual must have the license reinstated before returning to work in the profession. In Rhode Island, the only option for reinstatement of a CNA certification is to retake the NNAAP knowledge and skills examinations, and then reapply for licensing with the Department of Health. Given the number of job opportunities for CNAs in Rhode Island, a number of out of state CNAs may consider moving or commuting to Rhode Island for work. In most instances, this is an easy matter. An out of state Certified Nursing Assistant must provide license verification, including submission of license verification forms from all states where the individual is currently licensed to work as a CNA, to the Rhode Island Department of Health and wait for the necessary approval. If the CNA’s current state does not have the same or more rigorous requirements for CNA licensing it is possible that the Department of Health will require the CNA to retake examinations or undergo training to become licensed in Rhode Island. As the smallest state in the U.S., Rhode Island may not seem the ideal location in terms of job opportunity for a Certified Nursing Assistant, but it is actually the opposite. According to recent statistics, Rhode Island has the highest concentration of CNA jobs in the country. Currently, the U.S. average for CNAs is $27,650. In Rhode Island, the average CNA salary is almost 7% higher than the national median. Rhode Island’s average salary is $29,560 based on an average hourly rate of $14.21.